I have been tagged by Kris Cahill of Art & Clairvoyance … Here are the “Rules”. First come the 5 facts … oh dear, this is hard work! I have no idea whether these are weird or random .. you will have to decide yourself. I have not cut my hair at all in about 25 years .. for a short period time (1 or 2 years) I did cut my hair back then … but that is the only time (about 25 years ago) I have cut it in the last 40 or so years. Back when I was young, someone offered to read my palm … they asked if the length of my fingernails was average for me … I had never thought about that. I cut them short and then let them grow out long until they bother me and then I cut them short again. I have lived in the same house for over 30 years and I love living here. I wanted to be at least a twin if not a triplet so that someone would understand me. I used to cut stings of paper dolls out that were all connected together and identical. Once when I was a kid, my mom told me she wanted to be a twin too. When I was a kid, I used to sometimes do my homework up in the maple tree in the front yard. I would perch my books up there and then pull myself up onto my favorite limb and be in my own world. I can see I have actually told you quite a few revealing aspects of myself. Hopefully you enjoyed this. Thank you for participating! OK … now for tagging 5 others … It was hard to keep it to 5 … please know I thought of you! Awesome Diane, Thanks for sharing! It’s really kind of an intimate thing, writing like this. Happy New Year to you! I love this piece, so brilliant and I love the colors. I wish you a beautiful and blessed New Year!!! You must have enormously long hair and I am real curious to see it now. Anyway, a very Happy New year to you and I wish you many productive and fruitful days with lots of wonderful art. Here’s to a great 2008! Like Irene, I am most curious to see what you look like! Happy New Year! Have you done any self portraits? Happy New Year, new friend. no really, I wish I were that slim! 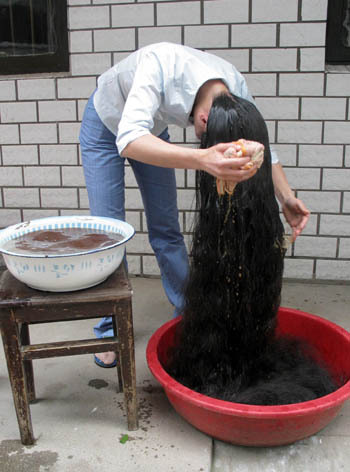 As all the others have said… you must have amazingly long hair! Hi Kris, Thank you and I am delighted that you love this! It is intimate. Hi Ellie, Thank you for your support!! Hi Debra Ann, Happy New Year!! Hi Irene and Beverely, Sometime I will get Susan to take a picture and show you … my hair is not all that long … just not cut. Though as I have gotten healthier, my hair had grown longer. Hi Shoshana, most of my faces are self-portraits … but none of my hair. I will have to get Susan to photograph … hers is MUCH more beautiful than mine!!! Hi Chris … I wish my hair were that nice! Hi Lady Banana, Thank you for coming and caring! Hi Sue, thank you so much too for being part of my journey!! Hi Nicola, Happy New Year!! I love the picture of you up on the maple tree 🙂 I, too, wanted a twin..got Rima instead (haha), we share so much in common and yet we are so completely different! I HATE going to get my hair cut (and I do it once or twice a year only)… Nice to read more about you.